Which of LA's Gated Communities Attracts the Most Celebrities? Haven on earth: This six-bedroom, eight-bath hilltop megamanse in Beverly Ridge, now on the market for a cool $18.5 million, features the obligatory infinity pool, outdoor kichen, famous neighbors like Tyler Perry... and the security of a guarded entrance. Not so long ago, LA’s high-profile elite visibly put down stakes in the flats of Beverly Hills. No longer. Today’s wealthy—Saudi princes and Oscar winners among them—are willing to pay a premium for real privacy. LA’s ritziest gated communities, from Malibu’s Colony to Beverly Park to Hancock Park’s historic Fremont Place, provide a level of security and (paparazzi-free) privacy that public streets no longer offer. In terms of home size and value, the gated communities linked by the Mulholland corridor are a cut above. Per Mauricio Umansky of The Agency, the pecking order descends from number one Beverly Park, notable for the size of its lots and $20 million-plus megamansions. (Umansky has sold 14 of the last 18 homes on the market.) 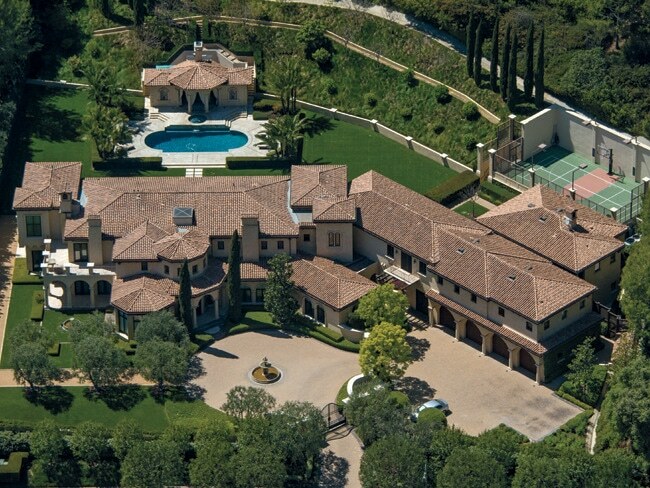 Brentwood Country Estates, home to Gisele Bündchen and Tom Brady’s stylish just-built manse, follows; then, it’s on to Beverly Ridge Estates and Mulholland Estates, where Christina Aguilera bought earlier this year for $10 million-plus and Paris Hilton and Charlie Sheen are neighbors. Bel Air Crest is another popular neighborhood, where $9–$10 million is the ballpark figure to move in. Divided into north and south sections, there are a total of 73 lots in the ultra fancy Beverly Park. In the fall, President Obama attended not one but two fundraisers in the barricaded enclave: the first at former Laker Magic Johnson and wife Cookie’s 12,169-square-foot Italianate-style mansion, set on just over four acres, the second held on the tented grounds of media mogul Haim Saban’s sprawling spread. It’s also where actor and producer Mark Wahlberg is building his 30,000-square-foot châteaulike dream house—remarkable for its own water park. Houses in Beverly Park, like this two villa-sized estates on Beverly Park Circle, must be zoned for a minimum of 5,000 square feet. “North Beverly Park is the most exclusive gated community in Los Angeles,” contends Umansky, who has followed the development’s progress from empty hillside to its current phase, where most owners have a net worth above the $300 million range and several are billionaires, like Viacom’s Sumner Redstone. Umansky’s most-recent listing is a 17,000-square-foot monster mansion on almost two flat acres priced at $23.5 million (below). 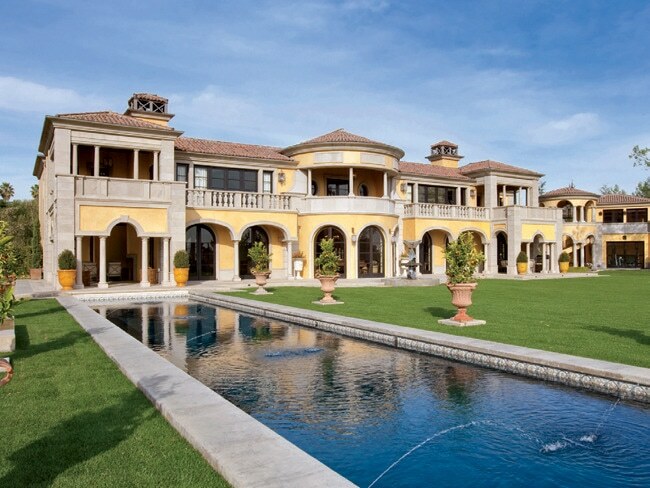 Owned by former major leaguer Barry Bonds, the seven-bedroom, 13-bath Tuscan villa-style estate is suitably ornate, complete with acres of travertine flooring, two-story guesthouse, sports court, professional-grade kitchen, spa, and the pro athlete’s fully outfitted gym—naturally. Beverly Park buyers “automatically become part of an elite and exclusive club, with some of the wealthiest people in the world as neighbors,” Umansky adds. Nick Segal, president and founding partner of Partners Trust, concurs, “Beverly Park is the quintessential gated community for stature, status, and cost of entry.” The two guard-manned entrances are a plus, as are the oversize lots. If there’s a drawback, it is the lack of substantial views from most lots. Beverly Park dwellers pay homeowner’s association fees of approximately $2,000 per month and abide by numerous covenants. For instance, no house can be less than 5,000 square feet. International buyers are attracted to the familiar concept “of a compound within a compound,” finds Michelle Oliver, estates director at Coldwell Banker Beverly Hills South, who says they lean toward the gated communities offering investment potential. These kinds of properties yield the highest leases. Oliver and her partner, Connie Blankenship, are representing a Beverly Park estate available for lease at a whopping $175,000 per month, and “the demand is always there,” adds Oliver. The team is also brokering one of Beverly Ridge Estate’s 14 hilltop megahouses: an impeccably detailed, $18.5 million, 12,500-square-foot villa built in 2005. It harbors six bedrooms, eight baths, an infinity pool, outdoor kitchen, and suitably “grand” interior spaces. Additional selling points are Beverly Ridge Estates’ easy access to the Van Nuys (private) airport and proximity to the Westside’s sought-after private schools. Boldfaced residents include Tyler Perry, whose custom home on the heights sits on 22 acres. This two villa property is being sold by ex-major leaguer Barry Bonds for $23.5 million, and features a pro-athlete’s gym. Gated enclaves have long been an LA real estate tradition. The 73 homes found in Hancock Park–adjacent Fremont Place were built in the teens and 1920s and continue to hold their value. Real estate agent Greg Moesser of Sotheby’s International Realty’s Beverly Hills office finds “Fremont Place is increasing in its cachet; historic properties and gated communities are in demand right now in the metropolitan area.” Many of the mansions were Craftsman-made and have numerous irreplaceable historic details such as original hardwood finishes and stonework. Despite its mid-city setting, Fremont Place is quiet and parklike; all the homes are on large lots and have deep setbacks from the guard-gated streets. Moesser points to the well-preserved A.P. Giannini estate (commissioned by the founder of Bank of America): Situated on two lushly landscaped lots, the home was built for entertaining on an impressive scale, and is listed at $8.5 million. On the opposite side of town, the Malibu Colony is another long-established, guard-gated enclave that continues to hold and excel in value. “Malibu Colony will increase or remain strong because you have a locked-in community in a prime location, which is gated, private, and secure,” explains Stephen Shapiro, chairman of the Westside Estate Agency. Shapiro is representing a 6,100-square-foot beachfront estate, listed at $18.95 million, noteworthy for its year-round livable size, indoor pool, and 41 feet of beach frontage. Although demand is high, gated communities are in limited supply. Will there ever be another Malibu Colony or Beverly Park in Los Angeles? “It’s tough to get that kind of acreage and raw tract of land,” says Partners Trust’s Nick Segal. Permitting won’t be easy either, advises The Agency’s Umansky. “Planned developments need a certain amount of space to make them feel like an enclave,” agrees Coldwell Banker’s Oliver. Planning and space issues seem to assure there’s a finite opportunity for expansion. Note to the 1 percent: Buy now or be left outside the gates.